More violations of federal human research regulations are flying under the radar as the HHS conducts fewer formal investigations that form the public record. 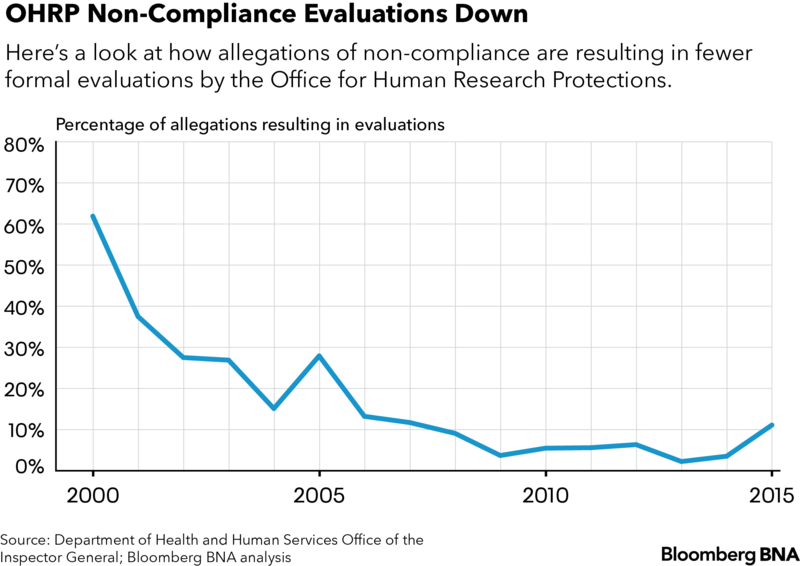 The Health and Human Services’ Office for Human Research Protections is conducting fewer formal evaluations into allegations of non-compliance with the regulations that protect human research subjects, data from a recent HHS Office of Inspector General report show ( OEI-01-15-00350). Those compliance evaluations typically result in determination letters that appear on the OHRP’s website. The letters include a summary of the allegations and whether a violation occurred, along with the name of the institution, institutional officer, and the researcher or researchers if the allegations pertain to a specific study or studies. The number of allegations resulting in a compliance evaluation has gone down 51 percentage points—to 11 percent from 62 percent—between 2000 and 2015. Out of the 147 allegations received in 2000, the OHRP investigated 56. Yet out of the 54 allegations received in 2015, only nine resulted in a formal evaluation. But 2015 also was the same year the OHRP issued the proposed changes to the Common Rule, a major endeavor that consumed much of the office’s energy and focus. The final rule came out Jan. 19. In some years, the OHRP investigated even fewer allegations than in 2015. At its lowest point in 2013, the OHRP formally investigated only three out of 134 allegations—slightly more than 2 percent. Since 2000, the OHRP has investigated around 17 percent of all allegations—338 out of about 2000. As of Aug. 15, the OHRP has posted zero determination letters on its website in 2017. The human research protection regulations known as the Common Rule ( 45 C.F.R. 46) require federally funded human subjects research and some other studies to protect those subjects from undue harm. Those requirements include an ethics review and approval by an institutional review board, and that subjects give informed consent to participate before enrolling in the study. The OHRP’s compliance division is responsible for handling allegations of Common Rule violations. The HHS office typically works with institutions to bring them back into compliance. But the OHRP has the authority to halt all federally funded research at an institution, as it did with Johns Hopkins University in 2001 after a young patient died in an asthma study. The drop in determination letters doesn’t mean the OHRP is ignoring these allegations. When a study falls under both the OHRP’s and the Food and Drug Administration’s purview, the FDA often takes over cases as it has a much larger oversight program. ( There are more than 400 employees doing similar work at the FDA’s drug center alone, compared to the OHRP’s four staffers for its entire compliance division ). The OHRP has increased its use of other mechanisms, such as contacting the institution directly to address non-compliance allegations, the OIG report noted. But without a full-blown investigation, there’s no determination letter posted to the OHRP’s website, which means there’s no public accountability of these allegations that an investigator or institution may be violating the rules governing human experimentation. “We called on them to be more transparent,” Joyce Greenleaf, regional OIG inspector general in Boston and co-author of the OIG report, told Bloomberg BNA on Aug. 1. The OHRP agreed to make more of this information public, but it stopped short of saying that it would hold an institution publicly accountable in posting about these cases. The OIG recommended the OHRP post aggregate data on the full array of its compliance activities. “This information would provide context for interpreting OHRP’s responses to allegations of noncompliance as well as provide more insights to OHRP’s role in receiving incident reports,” the OIG report said. The example provided by the OHRP that’s in the OIG report involved a complaint about experimental orthopedic surgeries a doctor performed without review or approval from an IRB. The OHRP said it contacted the institution directly instead of opening a full-blown investigation. “The research institution substantiated the complaint and required the surgeon to complete additional training and withdraw a publication about the research. OHRP accepted these corrective actions but never opened a compliance evaluation or issued a determination letter,” the report said. With no determination letter, there is no public information about who the surgeon is or where he practices. Direct contact with the institution is one of the first steps taken by the OHRP when it receives an allegation, according to procedures posted on the HHS office’s website, Carome said. The HHS spokesperson said in an Aug. 2 statement that the orthopedic surgeon’s published studies were either case reports or retrospective chart reviews, and that the surgery was not experimental but rather involved standard-of-care treatments. An investigation by an IRB subcommittee found that the researcher had obtained an exemption from his previous institution to conduct the chart reviews but not from the institution where the allegations occurred. “The institution had already instituted a corrective action plan, as noted in the OIG report, which included additional training,” the report said. Gary Chadwick, a senior consultant with HRP Consulting who has spent nearly three decades on human subject research protection issues at the FDA, OHRP, and in academia, told Bloomberg BNA it has been the tradition of surgeons for years to experiment with new techniques and tell others via publishing if they work. Carome said he agreed the OHRP should have the authority to exercise enforcement discretion and forego formal investigations in some cases. But he said he’s troubled it appears the OHRP is using it in the majority of cases. Michele Russell-Einhorn, vice president at Schulman IRB, an independent IRB headquartered in Cincinnati and Research Triangle Park, N.C., said what she wants to know is how does the OHRP determine how it’s going to manage the compliance function, and what is the goal when it conducts site visits versus desk reviews? “It is interesting that on-site visits seem to get letters that are published but not desk reviews and so the question is why and what makes them different?” she said. Russell-Einhorn, who worked for the OHRP and is a member of Bloomberg BNA’s health-care advisory board, also asked whether the OHRP has the resources necessary to meet its vision to protect the rights, welfare, and well being of subjects involved in HHS-funded research. The OIG report is available at https://oig.hhs.gov/oei/reports/oei-01-15-00350.asp.